Spray Foam Insulation can be used in Attics, Crawl Spaces, New Construction, and anywhere that you wish to seal gaps, cracks and air leaks where heat and cooling can be lost. 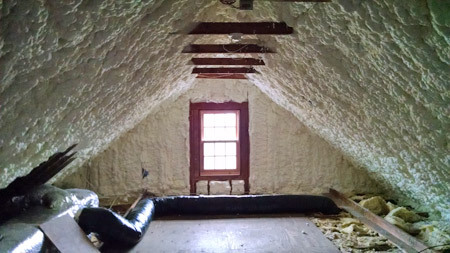 A typical "vented attic" can reach temperatures in excess of 140 degrees in the summer. When attic vents are eliminated, the building gets tighter. 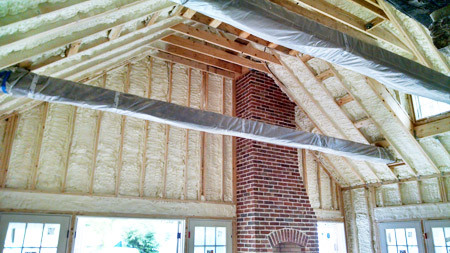 Vented attics create a path for air leakage. Air leaks from the house into the attic through duct work, electrical boxes, chases, holes in top plates, recessed electrical can lights, attic stairs, etc. All of these leaks are connected to the outdoors via the attic vents, essentially pumping your conditioned air outside of your home. We apply spray foam directly to the underside of the roof between the joists, down around the rim and into the soffit areas, on the gable wall ends, which effectively seals off and insulates the entire attic space from any air infiltration. Instead of your HVAC unit and ductwork operating in a harsh environment, they will now be in an interior environment that is typically within 10 degrees of the thermostat temperature inside the home year round. This extends the life of your equipment and creates a more energy efficient, comfortable home. Crawlspaces can be insulated in two ways: insulating the ceiling for a vented crawlspace or insulating the walls to create an unvented crawlspace. Spray foam insulation can be used in both ways to help address common problems associated with crawlspaces such as dampness, mold, and fiberglass insulation that won't stay in place. Unvented crawlspaces have many advantages. Moisture issues are eliminated. 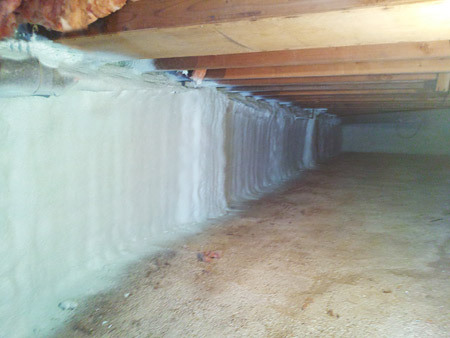 Warm humid air from the outside is no longer able to condensate on the cooler ducts and pipes in the crawlspace. This creates an area that is no longer damp and musty. HVAC units and ductwork now operate in a conditioned, dry environment which extend the unit's life and saves energy. Pipes that are located in the crawlspace are no longer in danger of freezing during the cold winter months. When creating an unvented crawlspace, Delaware Spray Foam installs a heavy duty vapor barrier over the entire floor and extends it up the wall 6 inches to prevent moisture from the ground from entering the space. We then apply 2 to 3 inches of closed cell spray foam on the exterior walls from the crawlspace floor, over the rim joist to the subfloor above. This creates an air, vapor and thermal barrier, protecting the space from the outside environment. When using spray foam to eliminate unwanted air infiltration, your architect and engineer can design your project accordingly. By insulating and air sealing with spray foam, Delaware Spray Foam can help create an energy efficient home that is more comfortable and quieter than a home built with traditional insulation. Many times the HVAC unit can be downsized, saving money in the upfront cost of purchasing the unit as well as the reduced energy cost in operating a smaller unit. 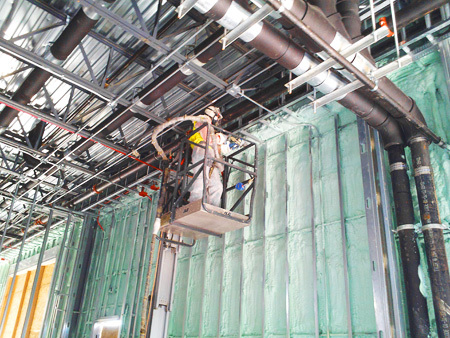 Save time and money on your commercial building with Spray Foam Insulation. Our closed cell foam can provide you with an air, vapor and thermal barrier in a single application by a single contractor!